The letterman tradition is one of the longest standing honors in American colleges. 2014-15 Upper Deck Lettermen Basketball takes the signed letter concept and develops an entire product around it. Each hobby box has a pair of signed cards including one Lettermen Autograph. Collectors can also expect to find at least one memorabilia-focused insert and a handful of numbered parallels. The focal-point Lettermen Autographs have been around in different forms for a while now. These use manufactured letter patches, similar to those you'd find on the back of a jersey, and add a signature. In the past, Upper Deck has had athletes sign on the patch. They've also done cards where the autograph is on an acetate overlay. It appears that these are done on the frame of the card. Rookie Lettermen are numbered to 65 or less. 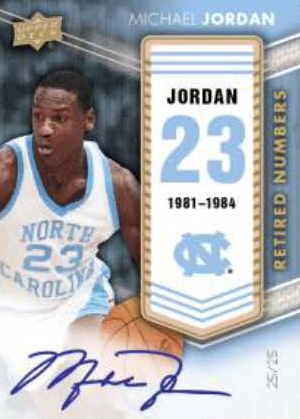 Legendary Lettermen, which include Michael Jordan, LeBron James, Magic Johnson and Larry Bird, are numbered to 50 or less. Most memorabilia cards take a manufactured relic approach. 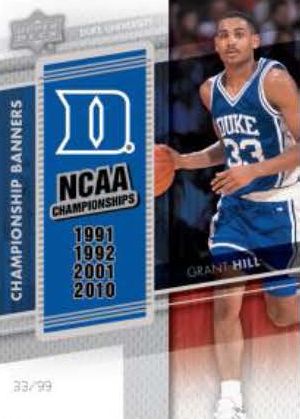 Championship Banners (#/125 or less) and Retired Numbers (#/99 or less) have commemorative banners embedded in them. Both come with autographed versions. 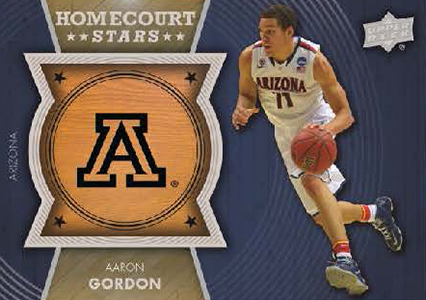 Other premium memorabilia-themed inserts include Monumental Logo Patches (#/50 or less), Home Court Stars (1:15 packs) and Home Court Stars Autographs (1:63 packs). 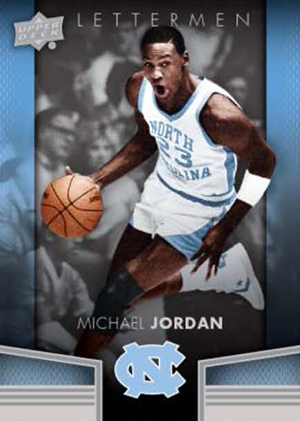 The 2014-15 Upper Deck Lettermen base set has 50 base cards and 30 Premier Rookies (#/999). Boxes have a total of six parallels numbered to 499 or less. Veteran parallels come in Blue (#/249), Silver (#/15) and Gold (#/5). Rookie parallels are Blue (#/499), Silver (#/99) and Gold (#/10). The three color parallels are also present in the base autographs set. Please note that the following images are mock-ups. Designs and content are subject to change. 30 cards. Serial Numbered #/999. 48 cards. Card #42 is only available as a Silver parallel. The cards for each player spell out their college or high school. The specific word is noted with each player along with the full print runs (PR). The first print run below is the total amount for all puzzle pieces and the individual pieces and print runs are noted after that. Still not seeing these out yet — is there a delay ? Card design is ok, but the regular inserts are simply the base cards with a slight colour change and numbering. Which is pretty lazy. As well I was very disapponited that among the 2 autographs in each box one could be of an undrafted player. The box is basically a big lottery to see if your 1 Letterman Auto will be of someone you want.